Unsocialized: A new Dr Who... a new Scotland? I hadn’t noticed the little blue coffee shop in the park until the dug pished oan it. The guy opened the door an’ stared at me. Cheeky clown. Him aw dressed like some charity shop ned wi’ a big lang scarf an’ a wee funny tie. “Wit time is it pal?” he asked me. Ah took ma mobile out ma pocket an’ checked. He wiz pure taiken the piss. He looked down at Sparky. “Hey, pal,” sez I. Less of yer jip. He smiled at me. He looked like a junky, like. Nae teeth at the front an’ aw pale an stuff. “Ah’ve jist regenerated. Ye’ don’t happen tae have a wee mirror oan ye?” sez he. Ah didnea know wit “regenerating” wiz. Our area wiz “regenerated” an’ the rents went up an’ then they sterted tae sell the hooses aff tae rich students an’ snobs. Ah kinda guessed he wiz sayin’ he had jist put his clobber oan. But his accent wiz no fae roon oor way. More like somewhere like an island or sumthin. I let him look at hesel’. He looked kinda upset an aw. He looked at me again and smiled. 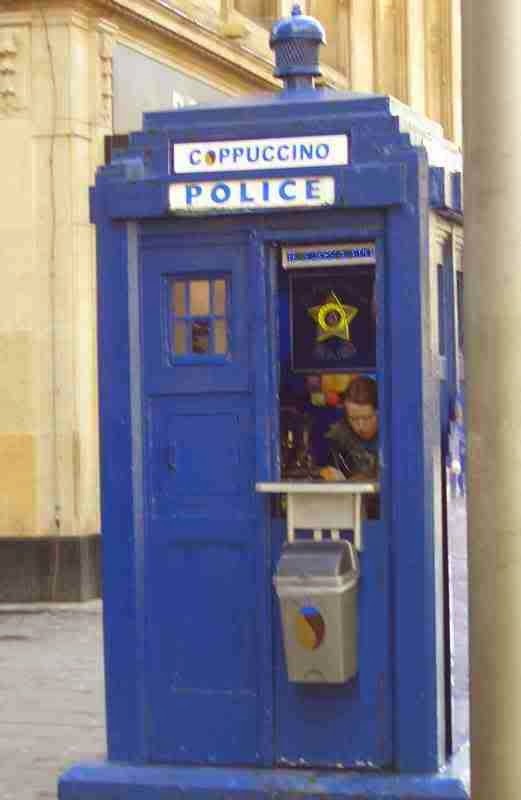 “Oh wit a clever TARDIS!” sez he. “Aw course!” sez he. “Hey, pal,” sez I, “Ahm nae tardis.” I didnae nae wit he wiz oan aboot, but he wiznae getting’ away wi’ that. Now, ahm nae saft touch, like, But ah wiz a wee bit feart about going in there. He went in before me, an’ before ah could say onything, wee Sparky had followed him. Now, when ah tell ye wit ah saw, ye’d think ahm pullin’ yer chain. Now, he pressed buttons an’ danced aroon and twisted we turny things. He was definitely oot a’ his scone. But then something strange happened. The whole place started to shake and make a funny noise. “Ah jist wan a wee caperchino wi’ chocolate powder oan the tap pal!” sez I. He danced and pranced aroon’ the big funny table in the middle of the big room. An’ that’s when it dawned oan me. These coffee places had a nice wee bit a room at the back. I used to wonder where they stored aw their coffee and wee nut biscuits an’ aw, when the place wiz shut. Now ah knew. An’ what he showed me knocked ma sidey ways. A’ NHS that worked. Schools full of books. Students wi’ full grants tae tide them o’er while they learned. Work oan the shipyards, collierys, and people with plenty aw money tae pay their electricity and gas. We saw fantastic music, an beautiful art aw by workin’ class men an’ women. We saw working class politicians making decisions for working class people an’ the Aristocracy dying off. We saw a world where people had hope. An’ then we saw her, sewing seeds of discontent, jealously and greed. We zoomed through time an’ space… and we defeated Daleks and Cybermen and creepy wee statues you couldnea blink at. An’ then he dumped me an’ Sparky back in the park. An he wiz away. An I knew wit ah had tae do.